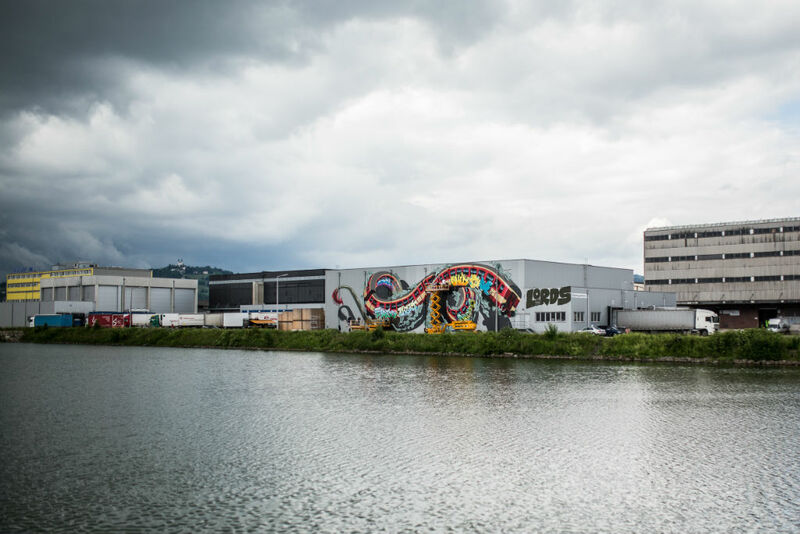 A couple of weeks ago, six members of the LORDS CREW painted a huge new piece at the Mural Harbor in Linz, one of Austria’s most innovative spots for Urban Art and muralism. 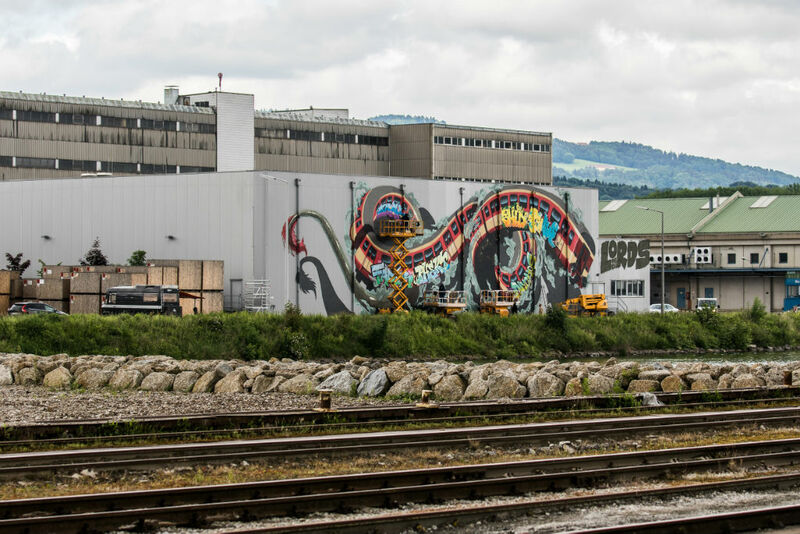 ”Lords Of The Red Dragon” almost takes in 500 square meters – That’s a proper size to celebrate the crew member’s mutual love to Graffiti and to fix the bond between their different roots in California and Austria. For a long period of time, Linz had to live with the image of being Austria’s industrial town. A state, that has its roots in the city’s expansion, which took place during the Industrial Revolution in the 19th century. What strengthened this image even more was the transformation of Linz during World War II. The plan was to enlarge and expand the city to make it an industrial, administrative and cultural center. Thus, a harbor installation was constructed in order to optimize the transport of raw materials like ore and cole, mainly needed for supplying the steel industry. Today, 60 years later, the harbor in Linz has changed into an innovative spot, that stands for cultural and artistic freedom. This was mainly initiated by the people from Boxoffice – an office complex that’s built out of old freight containers. Besides working on ideas how to integrate containers into modern architecture, the complex provides space for the organization of cultural events like the Bubble Days festival, which came into being four years ago. 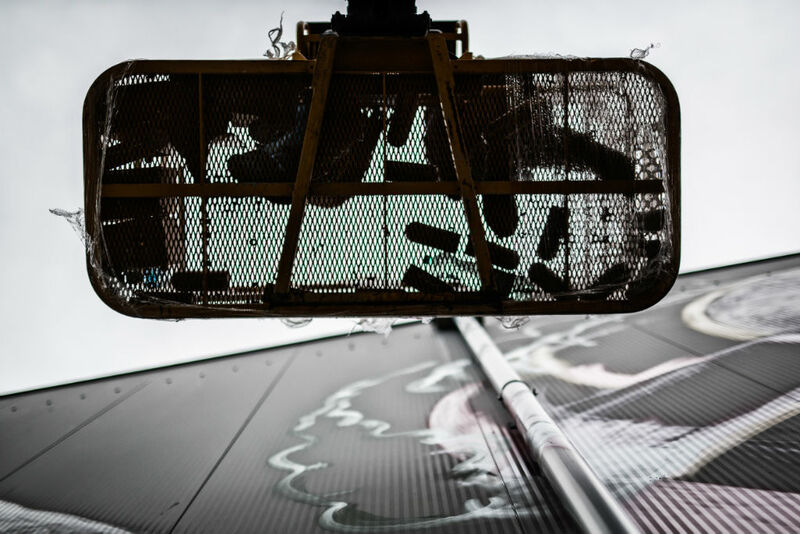 Initiated by Leonhard Gruber, who is working for Boxoffice, and in the course of the festival the area has been transforming into an open air gallery: The Mural Harbor – a place, where artists are invited to paint the grey walls of the surrounding industrial buildings as well as old freight containers. Over the last years, many renowned muralists – like ROA and Aryz for example – have been embellishing the area with their art. 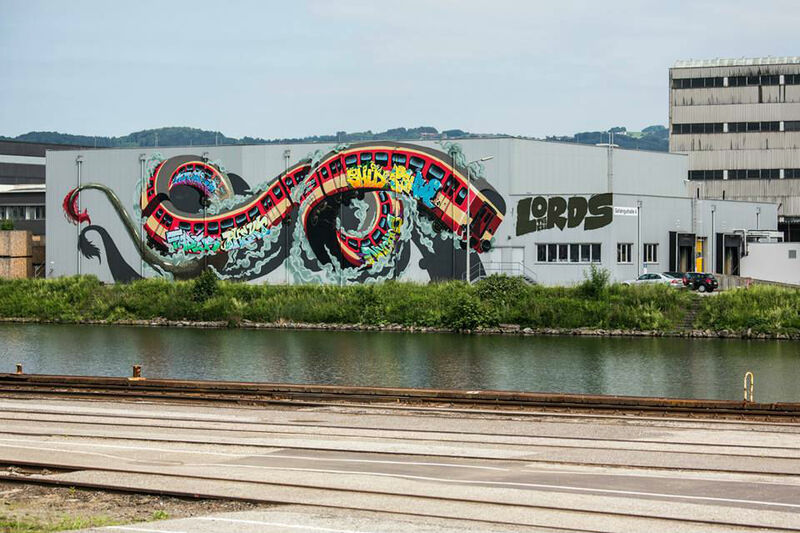 In the course of this year’s Bubble Days, the LORDS CREW was invited to contribute an art work to the Mural Harbor. 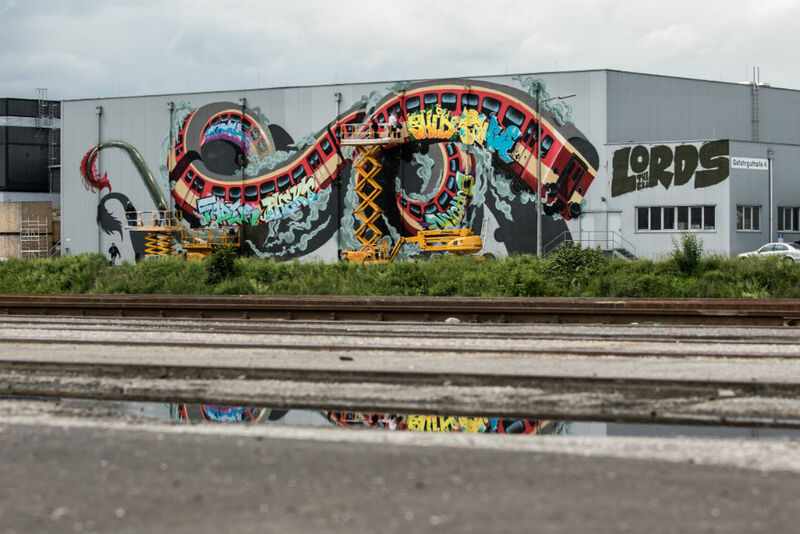 The LORDS (Legends Of Rare Designs), founded in 1986 in San Jose, is a collective of Graffiti artists from California with members in Austria. 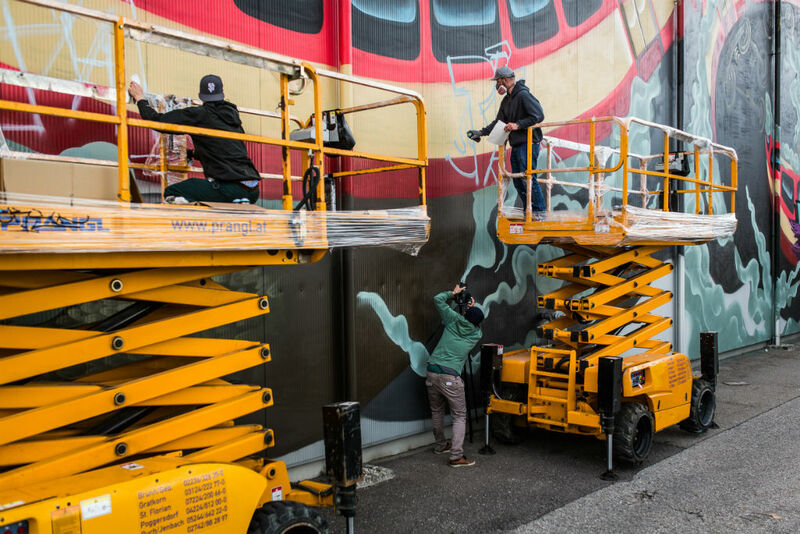 To strengthen their special connection, austrian crew members FADER, NYCHOS, PHEKT, SHED and SHUE77 invited Graffiti legend Lord QUAKE from San Francisco to paint this large scale mural together with them. ”Lords Of The Red Dragon” is the bursting outcome of a small crew reunion and celebrates the artists’ mutual love to Graffiti. THANK YOU Poidl for making this happen and for showing Austria how to do it, THANK YOU Montana (500 square meters – you guys are our heroes! ), THANK YOU Christian Fischer for capturing the process in another amazing video and THANK YOU Philipp Greindl (Flap.at) for taking these awesome shots.